Today I am full of pride. In fact I can feel it welling up inside me like it wants to burst. I’m so proud that it’s almost palpable. I’m totally 100% happy to feel that pride. Why? Because it’s not directed at myself: it’s for my daughter. My daughter has my love of reading and language. She reads every day and has been reading far above her level for as long as she has been able to read. Today, in a meeting my wife had with my daughter’s school, they informed her that they were going to refer my daughter to a gifted program for language arts and reading. Additionally, they told my wife that she is doing very well this year and is adjusting well. This is a big deal for her as she is extremely introverted to the point of being referred to a specialist to see if she may have Asperger’s. We’re still waiting for that trip to the specialist as it’s incredibly hard to get in to see him. To hear that she is doing well and is working well in social situations (as well as we could hope for) is a great thing. As a parent you want what’s best for your child and I know that a program that helps addresses her abilities in language arts and reading will be fantastic. When I was her age, I spent most of my time wrapped up in books. I learned about the world around me by reading and not by experience. My daughter is the same way. She reads books and she loves music. It’s like watching my childhood unwrap in front of me all over again. I love to listen to her sing and to watch her pick out tunes on the piano after having only heard a song once or twice. She has a beautiful voice and an incredible amount of potential if she chooses to pursue music seriously. I love her so much and I am so proud of her accomplishments and her growth and development. I know that she will have challenges to overcome. I had to overcome a lot of similar challenges when I was her age. I know she can do it and I’m so happy to know that she will excel in whatever she chooses to do. For now, I’ll continue to gush with pride and admiration for the only other woman in my life that I love as much as my wife. I’ll continue to cheer and guide her and continue to discover just how deep a father’s love and pride can really be. Today we went for a bike ride with the kids. Well, I wasn’t riding a bike; for me it was more of a get-my-daughter’s-bike-rolling-and-then-run-after-her-while-she-rides kind of event. My daughter is almost ten and she has overcome a lot of challenges to be able to ride her bike as well as she does now. Since she was little, she’s had some issues with sensory integration. Things that are simple for most people can present her brain with conflicting messages about where her body is in space. When she was really young, going up and down stairs was a real challenge because each stair, to her brain, was the equivalent of stepping off the edge of a cliff. To get her through some of these challenges, she went through a lot of Occupational Therapy and hard work. Eventually, she learned how to do things like swing on a swing set, go down a slide, climb stairs and play like other kids her age. However, things are still present a challenge for her where others may not see any problem. One of these things was riding a bike. The motion of riding a bike and the tilting to the right and left were a lot for her to be able to come to terms with. Eventually, we spent a week with her at a camp where they teach kids with special needs how to ride bikes. It was the best thing we ever could have done for her. She was able to learn to ride in a way that worked with how her brain processes information. Now, she just needs a little help getting started and she’s off like a flash. Seeing her ride her bike for about a quarter of a mile nonstop was just great. It’s a wonderful feeling to be able to see your kids growing and becoming more independent little by little. It’s also a great reminder of the impermanence of all things. When I see the smile on my daughter’s face after she stops the bike and waits for her mom and dad to catch up with her it makes all of the hard work, all of the time spent, all of the stress and pain of trying to help her be able to have experiences that most of us take for granted worth it. I am so proud of her and everything that she has done. She never gave up on learning to ride and her dedication to things she wants to do is inspiring. She has a wonderful voice and whenever she hears a song that she likes, she won’t rest until she has it memorized. Then she’ll work on learning to play it on the piano. Her musical talents are great sources of joy for her and for me. I’m proud of her and her skills and I’m happy to teach her about music and encourage her to constantly improve to the best of her ability. I love her grasp of language and her sharp wit that can throw out a cutting one liner dripping with sarcasm and humor at the same time. I love the passion she brings to everything she does. Soon, she’s going to be ten years old and I can’t believe that she’s grown up this fast to be such a beautiful and wonderful little person. Sure, things will continue to change as she grows older but it’s going to be a (mostly) enjoyable experience for us. Change can be hard because we won’t have our adorable little girl any more and will have a growingly independent young woman on our hands but that’s our job: to help her grow and change so that she’s able to handle her own life. Parenting is an exercise in attachment and in letting go. I wouldn’t trade it for the world. I just had a great birthday dinner. I decided not to worry about what I was eating so I had spaghetti and Skyline Chili (a chili that is from Cincinnati, OH my native home). I even covered it with cheese. However, unlike my old self, I kept things mindful and I stopped after only one plate. The old me would have eaten the entire bowl of chili (over 500 calories in the can of chili alone) and eaten as much of the spaghetti as I could have. I’m happy that I was able to keep myself under control and have a delicious dinner that made me happy. After dinner, it was time for my cake. 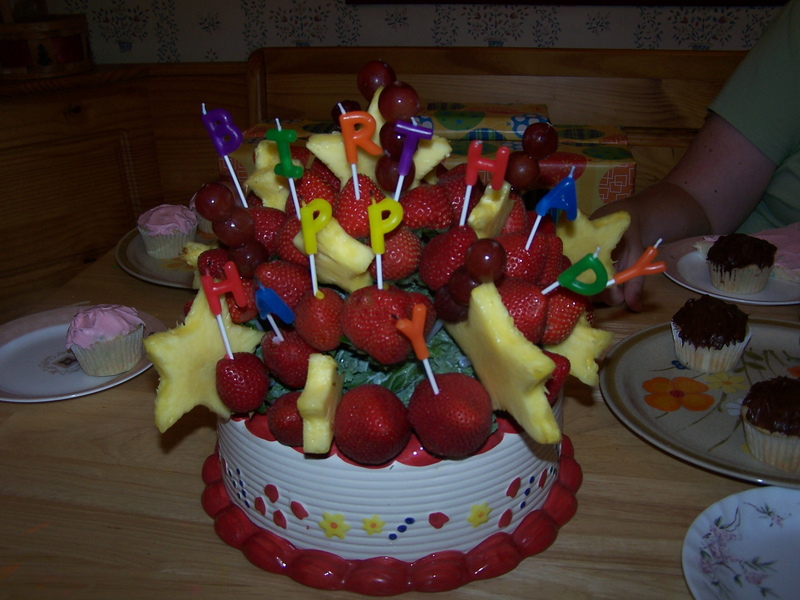 My wonderful and supportive family knew that I didn’t want a birthday cake because I am losing all this weight and instead of a cake they got me something I’d never seen before: a cake made of fruit. 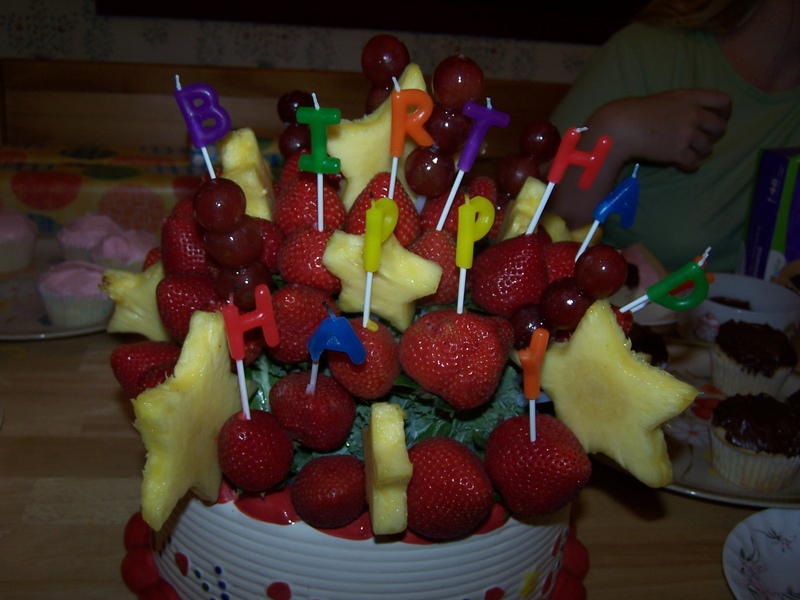 The base was a ceramic birthday cake and stuck to the cake were strawberries, pineapple and grapes. The fruit was fresh and sweet and hight quality. I couldn’t have asked for a better dessert. It made me feel loved and special that they were able to get this for me. I know that I have their support and this was just a fabulous reminder of that. Check out the pictures below. In addition to the great cake, I got two new books. I got Living Buddha, Living Christ by Thich Nhat Hanh and also The Essential Writings of Thich Nhat Hanh. My wife knows me well. I’m looking forward to reading these very soon. My kids got me some really cool Nerf guns. They’re the kind with the high capacity drums with the auto fire feature. We’re looking forward to taking them outside tomorrow and running around playing with them. It’s another great way to get exercise and to have fun with my kids. Impermanence is an important concept to understand. It is one that I am struggling to understand. Many people are scared of this concept but the reality is that all things are impermanent. Children grow to become adults, adults grow old and die, seeds grow into plants, plants die and turn into soil. Nothing will last forever. Nothing is changeless. In my suffering state, I assumed that my weight was permanent: there was nothing I could do, I had tried and failed many times to bring it under control. It is the illusion of permanence that causes suffering. When we attempt to hold on to someone or something and prevent change, we are fighting the universe itself. It is a fight we cannot win. We become like a child at the beach trying to protect their sand castle from the rising tide. As I begin to think about impermanence, it opens my heart to hope and love. I have hope that my weight will not remain like this forever: change is possible. I find that I cherish my children more as I realize that the time I have with them in the age they are in right now is short. They will never again be the people they are today. All I can hope to do is to love them as they are today, right now. I cannot prevent them from growing, learning, changing, growing up. The same is true for my wife. The person she is today is not the same person that she was when we were married. The person she is tomorrow will not be the same as she is today. For today, I will love my wife for who she is. I will never again have the chance to love her in the state she is in right now. I find that I have less fear of loss and greater peace in the knowledge that nothing is permanent. Giving up control and embracing the change that is at the heart of life has given me a new outlook and a stronger connection to those around me. If suffering is not permanent, I can work to bring it to an end in myself and in others. Even if I fail in my attempts, I do not worry. My failure is not permanent. Through impermanence, I am letting go of the perfectionism that has driven me for so long. In embracing impermanence I am embracing freedom.